Electric Uranus ist Wojciech Zięba, der Mann hinter dem Label Beast Of Prey. X-naVI: et ist das Projekt von Rafał Iwański, der auch für seinen Beitrag in Kapital und Hati bekannt ist. 2011 schlossen sich beide Musiker zum ersten Mal zusammen, um eine Kollaboration „Voices of the Cosmos“ (die ich nicht kenne) herauszubringen, und jetzt haben sie einen zweiten Teil dieser Arbeit geschaffen. Das Besondere dabei ist der Einsatz von Radioteleskopklängen in Kombination mit elektronischen, meist analogen und digitalen Synthesizern, Filtern, Effekten und Objekten. So schaffen die beiden polnischen Musiker gemeinsam eine feine, mystische Atmosphäre, ein kosmisches Ambiente. Neun großartige Strecken, um das Universum zu erkunden; einige sogar mit einem songartigen Charakter („# 3 Solar Wind). Electric Uranus is Wojciech Zięba, the man behind the Beast Of Prey label, X-naVI:et is the project of Rafał Iwański also known for it’s contribution in Kapital and Hati. 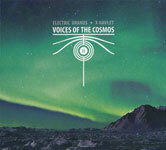 In 2011 both musicians joined for the first time to release a “voices of the cosmos” collaboration (which I don’t know) and now the have created a second part of that work. The special feature of this is the use of radio telescope sounds in combination with electronica, mostly analogue and digitla synthesizers, filters, effects and objects. Thus all together the both Polish musicians create a fine, mystic atmosphere, a cosmic ambient. Nine great tracks to explore the universe; some even with a song-like character (“#3 Solar Wind).